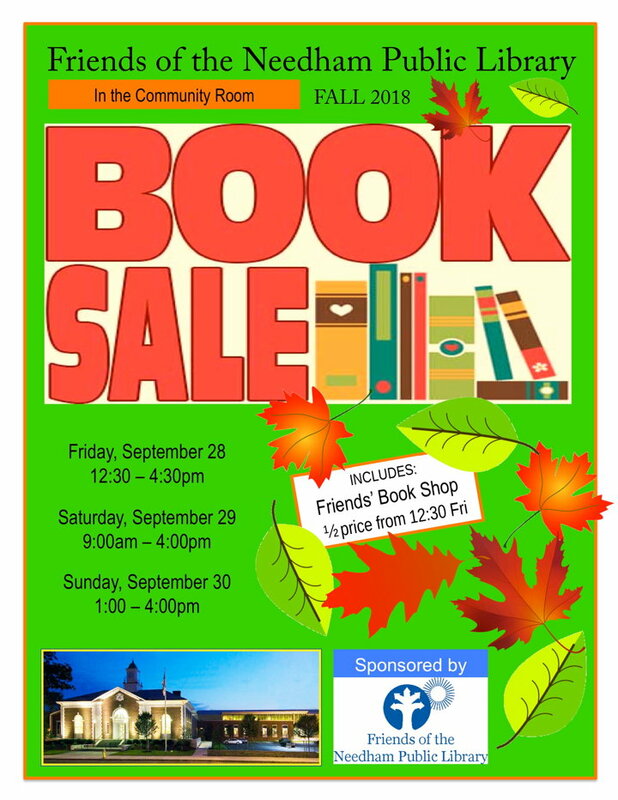 From Friday, September 28 through Sunday, September 30, 2018, we will hold our 46th annual fall book sale. Thousands of books will be for sale in the Library's Community Room. Separate categories include fiction, non-fiction, youth, young adult, cookbooks, home, gardening and crafts, religion, reference, foreign language, travel, sports, science, CD's, DVD's, and the arts. Seasonal holiday books will also be available in this book sale. Like our June, 2018 sale, this book sale will be open on Friday from 12:30 to 4:30 p.m., in addition to the usual Saturday and Sunday hours. On Friday and Saturday, hard-cover and trade paperbacks are priced at $1.00 and mass-market paperbacks are 50 cents each. Sunday is Bargain Day; all items are half-price and a brown bag of books is $8.00. In addition, individually-priced books in the Friends' Book Shop will be half the marked prices beginning at 12:30 p.m. on Friday and continuing on Saturday and Sunday. Scanners are permitted. Buyers should not put aside books indefinitely; after two hours books should either be purchased or returned to the sale. The sale will be in the Library's Community Room. Enter through the Library's main entrance, which faces the Rosemary Street parking lot. Here are directions and parking information. Friday, September 28, 12:30 p.m. - 4:30 p.m. and Saturday, September 29, 9:00 a.m. - 4:00 p.m. Separate area: 2,500-3,000 individually-priced better/older books in the Friends' Book Shop. at 50% off the marked prices. Sunday, September 30, 1:00 p.m. - 4:00 p.m. Bargain Day. For a higher-resolution version of this book sale poster in Portable Document Format (PDF), click here. For general information about our periodic book sales, the dates of future sales, and how to receive notices of future book sales by email, click here.